Previous posts described how to use curl, cron, JSON, Python, matplotlib, and HTML to create an automatically-updated custom API performance web page. In addition to providing API performance data, the API Science API also provides uptime data for the APIs you monitor. 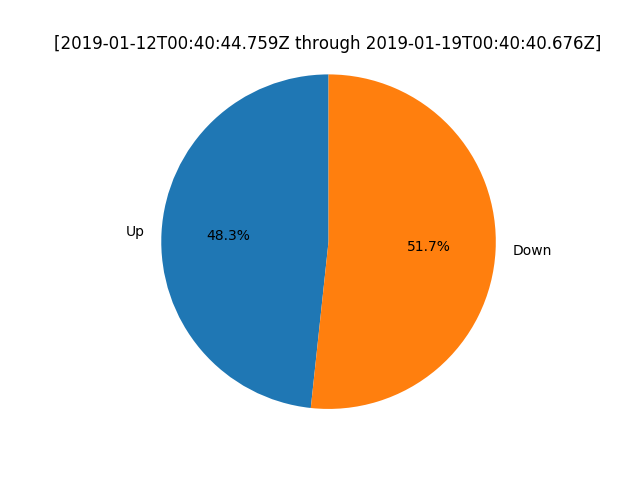 In this post, I’ll demonstrate how to download API uptime data and create a web page that consists of a pie chart depicting the API’s uptime over a particular time frame. Here, the numeric 1572753 is the identity of the particular monitor for which you’re seeking performance data. preset=lastWeek means we’re accessing the monitor data for the past week. resolution=hour states that we want the monitor data binned by hour. The Bearer variable is your authorization code for accessing the API Science API. The post How to Use MatPlotLib to Display API Performance Data describes how to make a Matplotlib XY plot with time on the x-axis and performance on the y-axis. In this example, we use Matplotlib to create a pie chart that maps uptime versus downtime. The downtime percent is simply 100.% minus the uptime average. The last line outputs the plot to a PNG file that can be loaded into an HTML web page. cron is a job scheduler that runs on Linux and Mac (Windows and most other operating systems have equivalents). cron can be used to launch a script that runs the curl command to download the latest uptime data and port it to a text file. Subsequently, the Python program is run to read in the new uptime file and create a new pie chart containing the latest uptime data. Note the meta line. This tells the browser to refresh this page every 60 seconds. Thus, if the cron command re-launches while the user is viewing the page, the web page will be automatically updated with the latest pie chart within 60 seconds, without any user action. With a very small amount of code, we’ve applied scripts, curl, JSON, Python, Matplotlib, cron, and HTML to create an automatically-updated web page that displays API uptime metrics based on data accessed from the API Science API. API Monitoring, API Science API, Integrations, JSON, Performance, Reporting. permalink.